The energy that fueled Hip-hop can be found in the parks of The Bronx. Hip-Hop Jazz Percussionist & MC The ZYG 808 visits his musical roots and talks about the oral traditions of the African Diaspora that are at the roots of rap music. The ZYG draws inspiration from the birthplace of Hip-hop. 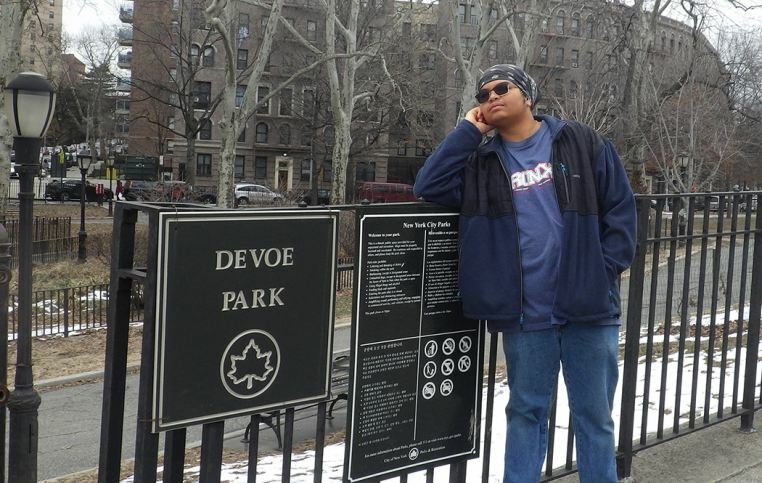 BRONX, N.Y. - Feb. 20, 2018 - PRLog -- Standing in Devoe Park, The ZYG 808 finds himself literally at one of the significant crossroads of Hip-hop, where Sedewick Avenue and Fordam Road intersect. Many years ago in this same spot, Hip-hop pioneers like Grandmaster Caz, and DJ Whiz manned their DJ equipment, powered by electricity stolen from a nearby street light. Several blocks down on Sedgwick Ave, Kool DJ Here threw the original hip-hop parties. A few blocks in the other direction, break dancers once performed in the center isle where Fordham crosses the Grand Concourse. MCing takes it's roots in the street poetry tradition, which itself draws from some of the Griot traditions of West Africa. Griots hold the multifaceted position of being oral historians, storytellers, advisors, teachers, philosophers, and seers, and rap is seen as a clear derivative of this tradition. This section of the Northwest Bronx was a blending of West Indian, Puerto Rican, Cuban, and Black folks originating from the south; all of whom -being products of the African Diaspora- carried a version of the Griot traditions; calypsonians, toasters, pergones, and signifiers are all aspects of the Griot tradition that along with preaching, are root influences of MCing. Likewise, these where the neighborhoods where jazz, salsa, mambo, ska, calypso, soccer, soul and boogaloo mixed, mingled and merged, and eleké clad drummers sat in circles playing congas, shakers and cowbells. For The ZYG 808, these are the traditions and cultural elements that informs his development, with his natural curiosities led to his exploration of the roots of his craft. "With jazz, a lot of the information -as well as a lot of mis-information- is at your finger-tips. This is a history that they try to bury. I'm so glad there's going to be a Hip-hop Museum." A short conversation with this young man makes it clear that he could be a tour guide for the museum when it opens. The ZYG 808 is currently in the studio working on his debut solo album, "The Intro" collaborating with the Down Streeters at the boards, creating a project that nods to the old-school flavor of hard beats (he is a drummer, after all), and considered lyrics. With the self-assured proclamation, "I've got one foot in the rap game and the other in the music business." We can expect amazing things down the road from The ZYG 808, who is currently finishing his freshman year of high school.